While there are virtually thousands of commercial beauty products out there all claiming to be the next best thing, we know all too well that most of them can actually wreck havoc on our skin. Luckily, Mother Nature has provided us with an abundance of natural products which we can use in our everyday health and beauty routines; we just need to understand what exactly to use and how to make the most of these natural ingredients. Below, we are showing you how you can use the oh-so-popular yellow spice, turmeric, to help restore the good health of your skin and pave the way to a beautiful complexion. First, a few tips on using turmeric facemasks. As many of us know from cooking with this fantastic spice, turmeric can stain your skin bright yellow, which is not a good look for your face! Luckily, there's a simple solution: following up your turmeric facemask with a homemade exfoliating sugar scrub will remove even the faintest hint of yellow. There are also a few other things to bear in mind: Mix turmeric with other ingredients and never just use it as a paste with water. Don't leave the facemask on your skin for an excessively long time (this isn't a facemask you can use while you take a pampering hour-long bath). And if you have really fair skin, then you might need to be careful, so use your judgment to decide whether to try out these face mask recipes. One last practical tip? Use disposable paper towels to clean your face, to save your nice bath towels from being stained! Why use turmeric for flawless skin? Well, turmeric has an active ingredient called curcumin, which may actually be able to treat acne and help get rid of scars, fight wrinkles, and even combat dark circles around the eyes. Since curcumin is antibacterial, it may help eliminate the root bacteria that cause acne in the first place, as well as fight the inflammation and pain that often accompanies acne. Once you start using a turmeric face mask on a regular basis, your everyday skin problems could start fading away. Turmeric face masks you have to try. 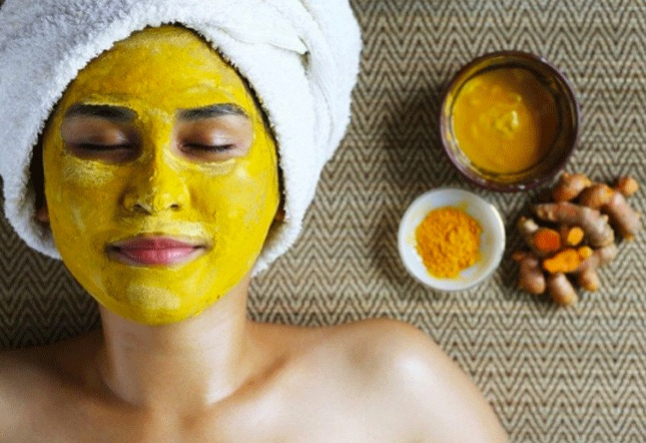 Here are 3 very effective turmeric face masks for you to enjoy. The best part? You probably have all the ingredients you’ll need to whip them up already in your pantry at home! When used in conjunction with some raw honey and whole milk, turmeric can help turn a dull, dry complexion into a face that glows with radiance. Mix 1/4 teaspoon of powdered turmeric with 1 teaspoon whole milk and 1 teaspoon raw, organic honey, and ensure that everything is mixed together in a smooth spreadable paste. Before using the face mask, clean your face and pat dry. Then apply the paste to your face, allowing it to sit for a good 10 minutes before rinsing off with cool water and patting dry again. When used once a week, this mask should help rid the skin of dead cells and restore natural moisture levels. Who knew that by mixing turmeric with some yogurt and avocado, you could create a face mask that can help you get the more radiant looking skin? Well, it’s totally possible and super effective as well! Avocado helps tighten pores, but it also restores natural moisture levels and nourishes the skin. The same goes for yogurt, which also packs the power of B vitamins and zinc, fighting impurities and ensuring that your skin is free from excess oils. To make the double-radiance turmeric face mask, just blend one teaspoon of avocado with one teaspoon of yogurt as well as 1/4 teaspoon of turmeric powder. You can apply this mask to your clean, dry face and allow it to work for 5 minutes. Once the mask has done its work, wash it off with cold water and pat dry to reveal beautifully radiant skin! With a little natural help in the form of freshly squeezed lemon juice and organic honey, turmeric can help you brighten up dark spots on your skin and even out the tone of your complexion. This mask is great for folks with oily skin but can be used on any skin type. When used regularly, the brightening turmeric face mask will help tighten your pores and also tone your skin, promoting moisture levels in the skin cells and helping to rid the skin of excess oils. Combine 1 tablespoon of raw, organic honey with 1/2 a teaspoon of freshly squeezed lemon juice. Then add 1/4 teaspoon of powdered turmeric and mix it all together to form a smooth paste. Apply to mask to your face using a face brush, and then allow it to dry out completely, or at least 10 minutes if you’re a little pressed for time. When the time is up, just wash off the mask with lukewarm water and then pat dry. Are you ready to start scheduling some personal pampering time for your face? Using these easy turmeric face mask recipes, you could well be on your way towards achieving the best-looking skin ever!